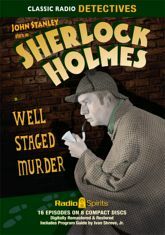 The brilliant Sherlock Holmes is more than equal to the baffling clues and confounding mysteries that he faces. John Stanley stars as the clever Consulting Detective, with Alfred Shirley as his loyal assistant Dr. Watson. The game's well and truly afoot in sixteen exciting tales from 1947-48!